Chris Aldridge's Blog & Website: Has Atlantis Finally Been Found? Has Atlantis Finally Been Found? It's been part of our ancient Greek heritage since the time of Solon, who delivered it to Plato via the ancient Egyptians. The two major countries of the ancient Mediterranean before Rome spoke of this place in great detail, about a mighty naval power beyond the Pillars of Herakles (Straits of Gibraltar), that met the wrath of the Gods for its arrogance and was wiped away by the sea. Plato, being a non-fictional writer, or at least someone who placed his stories among actual people and places, intrigued so many for countless years, and drove their ambitions to discover this lost world. I, being a lover of history, researcher, and who has even went on some archaeological digs in his life, have also spent many years pondering the whereabouts of its ruins. When I was in college for the first time at Davidson County Community College, I even tried to form an archaeological research team to try and find the location, but sadly it never got off the ground. Many people have proposed possible locations for Atlantis throughout the world. For many years, I thought the Azores were the remains, as they are obviously shattered islands in circular shapes beyond the Pillars, as Plato described, but I now believe Atlantis lies as the ruins of something called the Eye of Africa, which you can see in the picture on the left, taken by NASA. Many do not know about this spot. But if you research it by simply looking at it geographically from all angles, you can see that it rests on the western tip of Africa, beyond the Pillars, and that the sea clearly once reached its frontal canal which is still visible and leads into the circular shapes that Plato described. The shapes are argued to be natural land formations that just so happen to resemble Atlantis exactly (whatever), but even if they are, they could have been a place chosen to build the Atlantean civilization on. Enlarge the image and you can even see, on the cliffs surrounding it, the marks of rivers and waterfalls that fell into it, which Plato also talked about. The outer landscape clearly shows a massive influx of land into the continent from this region, indicating perhaps a tidal wave or some other great inrush of water for one reason or another. Many moons ago, northern Africa was not a desert. It was actually a very lush landmass with bodies of water. Due to climate changes and natural disasters, it became a desert, and as the desert moved in, more people fled East and settled on the only body of water left in that region, the Nile. And there, they founded Egypt, or Kemet. With them, these people probably brought the knowledge of Atlantis, some may even have been refugees or descendants of refugees from the destroyed Empire. The archaeological tragedy is that we know the Sahara was once a lush landscape, but we've never fully excavated it because of the immense dangers of the region. It's very hard to get a constant flow of supplies into the middle of a desert, not to mention the threat of thieves or terrorists who could assault helpless researchers. 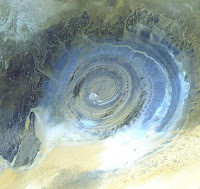 My bet is that remains of Atlantis are scattered all over the northwestern African desert. But as we research and ponder, let us also not forget the lesson of the Gods, delivered by Lord Poseidon, about this place. Hubris leads only to our destruction. Who knows, perhaps Atlantis knew of an impending natural disaster, but chose to ignore it because they thought they were greater than the Gods, as some people still think today, and their arrogance led them to find out the worse lesson for mortals, the lesson that you're not a God. For more information on this spot, see the following Video.